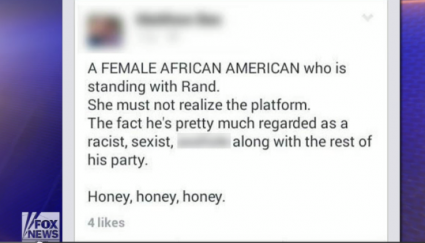 Tucker Carlson defends a black female's right to support Rand Paul. The G.O.P. welcomes self-loathing members of all colors. When a black female decides to "support the candidate who supports the Constitution," it's pretty obvious where she's getting her ideas, especially when that candidate supports the right to discriminate against her. The camaradarie of other young Rand Paul supporters who like the idea of the Libertarian "hero," must be pretty awesome. Supporters say that they are attracted to his alleged isolationism (which he's seemingly abandoned), and his Aqua Buddah past. Remember his 'brilliant' launch of his 2016 Presidential campaign? "We need to boldly proclaim our vision for America. We need to go boldly forth under the banner of liberty that clutches the Constitution in one hand and the Bill of Rights in the other." "It's sad that we're still getting caught up on subjectivity." "Well, the modern tribalism of the Left demands that each person choose a group and then agree with everything that group agrees with. Then, anyone who leaves that group, is STONED to death. (Do) You reject that?" Gee, Tucker, does she reject the notion of punishing someone to death by biblical savagery? Since when has the Democratic Party employed such tactics? Zuri says that she just wants diversity of thought. You know, that G.O.P. diversity? It's the collective idea of denying that there's ever been an issue of White Supremacy. Apparently, she also wants someone who's not afraid to deny science and who has no problem shushing a woman who is getting out of line. Should a woman be raped, probably because she was asking for it, she should be have no rights if she wants an abortion. Mr. Small Government wants to control all the uteri, Zuri Davis' body included. "As a Senator, Rand Paul has shown that he supports our rights and he stands for our rights." Little does this unsuspecting black woman know, Rand Paul also supports the rights for businesses to discriminate based on the color of your skin. I wonder how well that sits with her. Or perhaps she doesn't really know that black people have been subjected to racial discrimination? Anything's possible with the Randians. People don't change, they just learn how to hide their racism. There's no doubt Baby Paul still harbors such ideas. Shocking comments on social media! Zuri said she was a member of Young Americans for Liberty and College Republicans and she was called, an Uncle Tom. Ms. Davis is simply perplexed at how this could ever happen. These online attacks by people of color simply baffle her, because she lives in the idyllic world of denial and no one should tell her to take her head out of the sand.